This stunning Abstract Expressionist oil on canvas is by British artist Helen M Hale. 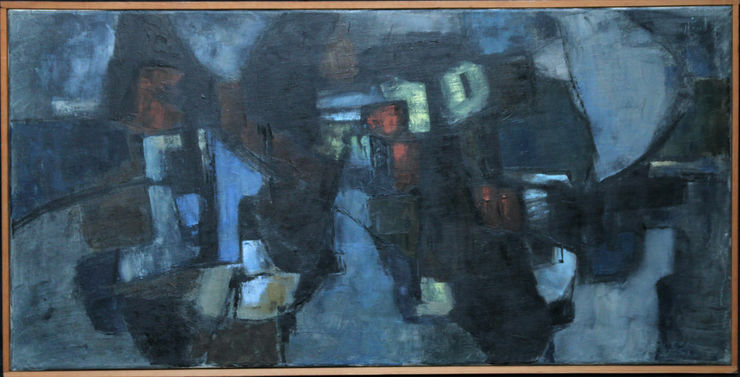 Painted in the 1960's it is a nocturne with bold brushwork and red, yellow, blue and violet colouring.Exhibition label verso with artist's details. Exhibited label from the Free Painters and Sculptors exhibition, circa 1960. (Free Painters and Sculptors is an artist-led organisation based in London, England, which regularly exhibits every year. It played a pivotal role in the establishment of abstract art in the 1950s and 1960s). Framed in a surround frame 41 inches by 21 inches and in good condition.